I am very pleased to welcome to my humble blog full of all things nordic and vikingy one of my favourite Valkyrie-sisters author Ingrid Paulson, the proud creator of Valkyrie Rising. 'Nothing ever happens in Norway. But at least Ellie knows what to expect when she visits her grandmother: a tranquil fishing village and long, slow summer days. And maybe she’ll finally get out from under the shadow of her way-too-perfect big brother, Graham, while she’s there. So once I have Ingrid settled comfortably in a silver chair with a pair of ravens perched on each arm rest, a horn of mead in one hand and a customary amber necklase as a welcome gift I quiz her on why she, like me, got into writing and not least of all, why she wrote about Valkyries in particular. I’ve actually been writing my whole life—I was a compulsive journaler and would sometimes venture into fiction. When did you decide to try and get your writing published? About five years ago, I wrote a novel. I didn’t know what I was doing until I was done. But when I showed the finished version to some friends, they all encouraged me to try to get it published. How long did it take to write Valkyrie Rising? Did it require several rewrites or did you have a planned structure you stuck to? It took about nine months to get a solid draft of VALKYRIE RISING to give to my agent. But after that, we did some serious revising, and when the book sold, I re-wrote the ending three times with my editor. So yes, I did some major rewrites to the book and I’m so grateful to my agent and editor for being so patient and wise! What was your experience like when you tried to get Valkyrie Rising published? Did it take a few years done as an individual or did you have an agent to assist you? The first novel I wrote got me an agent but ultimately didn’t sell, so when I completed Valkyrie Rising, it actually happened pretty quickly. We did a couple of rounds of revisions before sending it out to editors. How you would you describe your writing style? Are you an early bird or a late night owl? Do you prefer to be away from any distraction or can you write happily with the internet only a click away? As funny as it sounds, all of the above. It depends on what stage I’m in. During the first draft, when my imagination is going wild, I can write anywhere and tune anything out. I fall into fits of daydreaming in the middle of conversations and frantically jot the ideas down. In other words, I’m horribly rude during that phase. But when revising, I need quiet and I need to concentrate heavily. To me, revising is like a logic puzzle—you need to read for consistency and address all the hanging threads in your manuscript. How and when did you first get interested in Norse Mythology? My family is of Norwegian descent and I actually came up with the idea while visiting family in Norway with my grandmother. I knew it would be a perfect setting for a novel. I wanted to write a girl power story about a character coming into her own, so the Valkyrie part came to me immediately. The rest of the story just took shape around those two anchors. Why did you pick Valkyries as the feature characters of your book? I really like the idea of strong girls and few mythologies have anything like Valkyries. The closes parallels I can find in the more well-known mythologies are Artemis and Athena. How did you come up with the idea of using the Valkyrie’s good looks as a wicked enchantment? You know, it actually wasn’t a conscious decision. When I got to the first scene with the Valkyries in it, that was just how it played out. Sometimes your imagination has surprises in store for you when you actually sit down to write a scene! How and when did you come across the legend of the Morrigan? Is it something new and different or do you believe there is a genuine connection to the Valkyries of the Norse Legends? And why did you introduce it into Valkyrie Rising? When I was young, we travelled to the coast of Britanny in France and I became captivated with the stone monoliths in Carnac. That’s where the idea came from. I really wanted to incorporate that mythology into the book plus upon further research I realized much of that region had been visited by the Vikings and there were definite parallels in the mythology. Are any parts of your characters based on yourself or people you know? Yes, actually quite a few of the secondary characters were influenced by family in Norway. I’d say the grandmother is a bit like my own grandmother, who is tough as nails. Ellie and Tucker are straight out of my imagination. Did you find it easy to write in the mindset of a teenager? I went to Norway when I was about Ellie’s age, so it was surprisingly easy to remember how I felt and what was going through my mind. Tuck Holloway is a guy who says a lot with double meanings with all his come-backs and teases; did you find him the most fun to write? I had too much fun writing him. In fact, I miss him quite a bit! The way you portray Loki is very sinister and unsettling due to the way you utilise his shape-shifting abilities – it is one of his features as well as trickery and double-dealing that is picked up a lot in many other norse fantasies I have read, do you think Loki is entirely bad or one of those characters that likes to play sitting on the fence? I think few characters are entirely bad, but in my mind, Loki is a villain who never quite crosses into unredeemable. That’s my favorite kind of villain since it makes them more unpredictable. 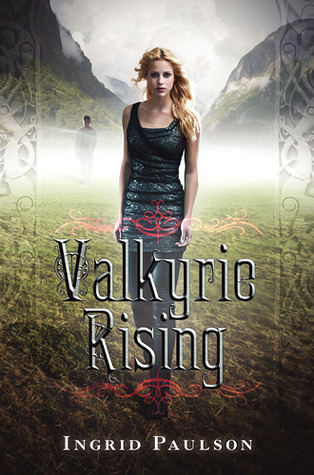 Was teenage love and romance always going to feature strongly in Valkyrie Rising? Yes. The moment Tucker Halloway entered my brain, I knew exactly where the story was headed. Did you always aim Valkyrie Rising at teenagers due to the characters being teenagers? Yes, I very specifically set out to write a YA novel and I wanted to show a girl at about that age who undergoes a major transformation in order to find the strength she’s always had. Have you begun the sequel and when can we expect to be realised, if you can give us an estimate date? I hope my few blog readers out there have their nordic taste buds tickled by this interview and I can't recommend Valkyrie Rising enough. It is an excellent read all the way through, reaches teenagers hearts and minds on so many levels, not just girls but boys also, is packed full of action, mystery, intrigue and magic - in fact why don't you just go ahead and click on the gorgeous book cover again to read my full official review.